Last weekend, the city was quiet, dare I say peaceful. With Wanderlust miles away and Jerry Day corralling the modern day hippies in Golden Gate Park, those of us left behind got open tables at cafes and a little room between yoga mats. It was nice! Summer is always a great time for music lovers! 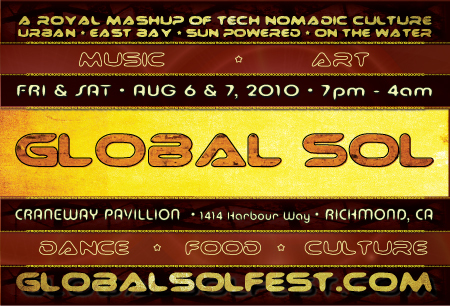 Global Sol Fest is coming to the East Bay Aug 6-7. The music line up looks amazing. And, as a bonus, it’s local. It’s great to get away and spend time at Bonnaroo or Burning Man or whatever but it’s even better to support the local economy and encourage more artists to come and share their talents here while inspiring locals in every way. No yoga superstars, no pool parties, just good music and, very likely, good people. Anything described as a “Royal mashup of tech nomadic culture” is worth experiencing! A little yoga off the mat!